I recently ran a one-hour hands-on workshop to give a group of 20 testers a taste of mobile application testing. This mobile testing taster included brainstorming mobile-specific test ideas, sharing some mobile application testing mnemonics, hands-on device testing, and a brief demonstration of device emulation. In advance of the session, I asked the participants to bring along a smartphone or tablet, either Apple or Android, with the chosen test application installed. I selected a test product with an iOS app, an android app, and a website optimised for mobile. I asked those who were able to bring a laptop, in order to compare mobile and web functionality. I set up the room so that participants were seated in small groups of 3 – 4 people. Each table had one large piece of flipchart paper and three different coloured markers on it. The chairs were arranged along two adjacent sides of the table so that participants within each small group could collaborate closely together. After a brief outline of what the session would cover, I asked participants to start brainstorming their test ideas for the chosen test application that they had available on the devices in front of them. They were allowed to use the device as a reference, and I asked them to choose one coloured marker to note down their ideas as a group. Five of the six groups of participants started a feature tour of the application. Their brainstorming started with the login screen, then moved through the main functionality of the application. The other team took a mobile focused approach from the very beginning of the session. After five minutes, I paused the activity. I wanted to switch the thinking of everyone in the room from functionality to mobile-specific test ideas. I encouraged every team to stop thinking about features and instead to start thinking about what was unique about the application on mobile devices. To aid this shift, I handed out resources for popular mobile testing mnemonics: the full article text for I SLICED UP FUN from Jonathan Kohl and the mind map image of COP FLUNG GUN from Dhanasekar Subramanian. These resources are full of great prompts to help testers think of tests that may apply for their mobile application. I also encouraged the groups to make use of their laptops to spot differences between the web and mobile versions of the software. The participants had a further 15 minutes to brainstorm from this fresh perspective using a different coloured marker. For a majority of groups this change in colour emphasised a noticeable change in approach. At the end of the brainstorming session there was quite a variety in the nature and number of test ideas generated in each small group. I asked the participants to stand up, walk around the room, look at the work of other groups, and read the ideas generated by their peers. Armed with ideas, the next phase of the workshop was to complete ten minutes of hands-on device testing. I asked each tester to pick a single test idea for this period of time, so that they focused on exploring a particular aspect of the application. Each group was asked to use the final coloured marker to note any problems they found in their testing. There were relatively few problems, but they were all quite interesting quirks of the application. Though ten minutes was a very short period of time, it was sufficient to illustrate that testing a mobile application feels very different to testing on a computer. The participants were vocal about enjoying the experience. As a facilitator I noticed that this enjoyment made people more susceptible to distraction. It was also interesting to see how much functionality was covered despite the testing being focused on the mobile-specific behaviours of the application. For example, one tester navigated through the product looking at responsive design when switching between portrait and landscape view, which meant that she completed a quick visual inspection of the entire application. While discussing ideas for this session, Neil Studd introduced me to the Device Mode function available in Chrome Developer Tools. During the last part of the workshop I played a five minute video about device mode, then showed a quick live demonstration of how our test application rendered in various devices through this tool. Device mode is well documented. I presented it as an option for getting an early sense of how new features will behave without having to track down one of our limited number of test devices. Emulators are not a substitute for physical devices, but they may help us consider responsive design earlier in our development process. As facilitator I did feel like this was a lot to cover in an hour. However, the session filled its purpose of giving the attendees a relatively rounded introduction to mobile testing. Perhaps you'll find a similar mobile testing taster is useful in your organisation. One of the things I've been thinking about is how I can get more involved with the work of individuals in my team without being a nuisance. I have deliberately avoided scheduling recurring one-on-ones or continually dropping by desks to see how people are doing, but I do want to be more actively involved in helping people tackle their testing problems and improve their skills. At the recent Nordic Testing Days conference I had the opportunity to speak with Stephen Janaway, a former Test Coach based in the UK. I mentioned my conundrum and he shared a solution from his organisation. They moved to a pull system where their coaches created a service menu for the development teams that explained what the coaches are available to help with. 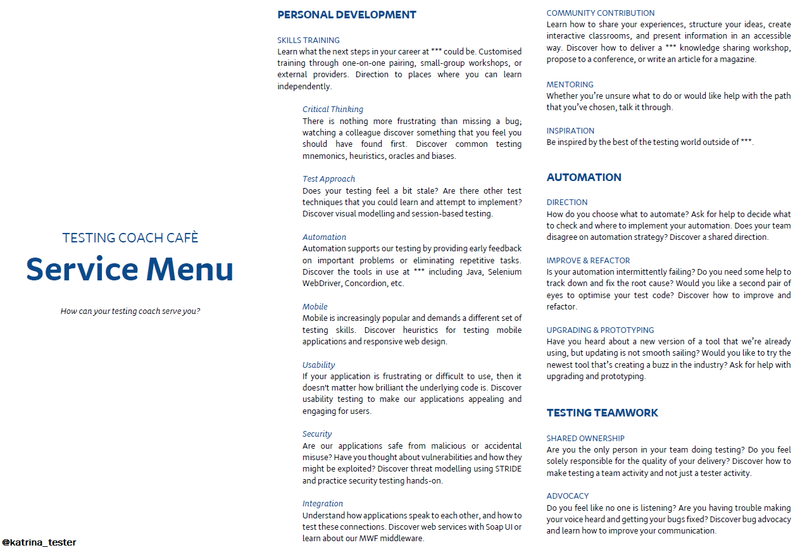 Stephen spoke about this system during his presentation at the conference and posted a real example of A Coaching Cafe Service Menu on his blog. 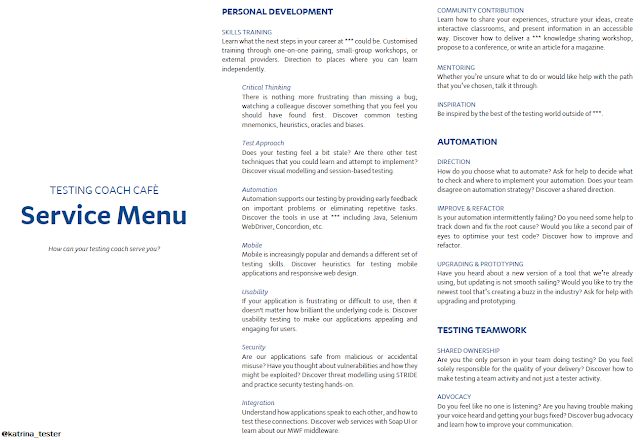 The menu provides an overview of some of the ways that I'd like to be working with each of the testers in my team. I hope it will prompt them to ask me for assistance -- a pull system rather than me imposing myself on them -- and clarify my role as their Testing Coach. I'm keen to do more individual coaching sessions that are focused on what people really want. If a number of people are requesting similar things, I plan to start running small group sessions. If I don't have the skills requested, I can find resources in the community, call on others in the team, or use external providers who may be able to help. And, if there's something that people want that isn't listed, then I've encouraged them to ask for that too! 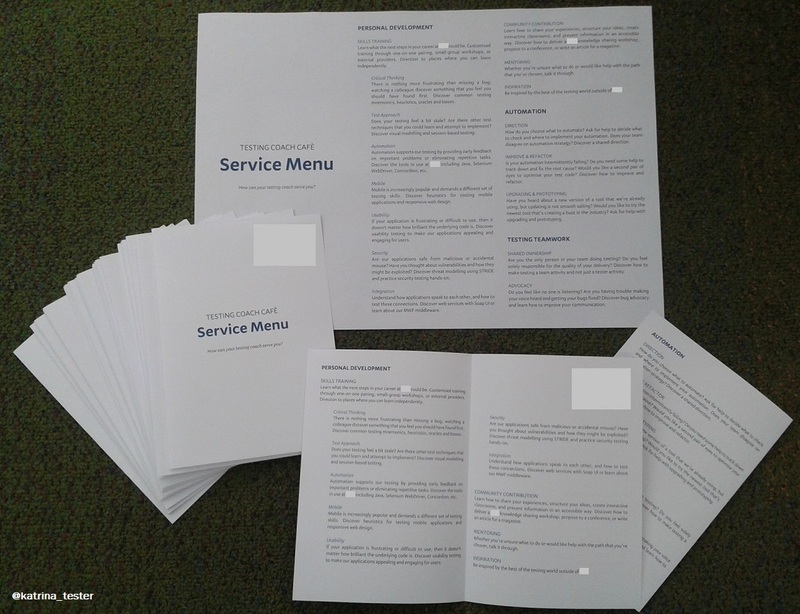 To share the menu with my team I created a printed brochure for every individual and an A3 poster that has been posted on our Testing Wall. I like the tactile nature of physical information, I think it helps emphasise important messages and creates serendipitous continued reminders. I also added the content to our organisation wiki and shared a soft copy of the brochure version via email. ... in the back of my mind I felt a bit guilty, like I shouldn’t be asking for help unless it was absolutely critical - and then I quickly realised, but that’s not how I like to be treated. Asking for help isn’t what you should do when you’re desperate, it’s literally when you would like help. I dearly appreciate it when someone surfaces an inkling of a concern in time for me to deal with it. The initial reaction to the Testing Coach Cafe Service Menu has been very positive and I hope that it will help me better serve my team.